If you're not familiar with RoadID, you must check them out. Especially if you run or cycle. Or have kids. 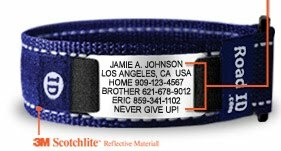 Now there are a number of different products all based around a simple aluminum tag: shoe tags, bracelets, anklets. The tags are replaceable, the info personalized. And now there's an interactive version which provides more of your emergency info online. Just brilliant. I won a coupon in a RoadID photo caption contest on Facebook which was the kick in the pants needed to finally place an order. I got one for myself (for running) and one for the Dude. I'm not a paranoid parent, but I thought it would be helpful for school outings and trips. We were out at a hockey game a few weeks ago and the Dude just had to stop to say hello to the cops monitoring the event. Of course, he had to show off his new bracelet -- they were blown away. They started going on and on about the people they discovered unconscious on the side of the road, or kids who were to scared to speak for themselves, lost in a crowd. It re-affirmed my decision -- for both us. Absolutely love this product. It's not a guarantee I'll be safe, but it does make me feel better that emergencies crews could track down my family if I couldn't speak for myself. Do you have any safety tips or similar products you use to keep your family safe on the road? Leave a comment!